It will come as no surprise to you that I love flowers! Candice's Honey Bees set was great fun to work with this week. Do you see the bee on this card? I stamped him on white shrink plastic, then shrunk him and added Stickles to him. Most of the flowers are raised on foam tape as well. (Yes, I know that I sometimes get carried away. . .) I added the smallest size of the A Muse twinkle stickers to the flower centers. A bee that shimmery needs some bedazzled flowers to feast upon, right? For my second Honey Bees card, I stuck with a more traditional honeybee theme. Cardstock is black, Lemon Zest, Summer Sunshine, and Stamper's Select White, and ink is Lemon Zest, Summer Sunshine, and Black Brilliance. I restamped the large bee in a glue pad, then added some black flocking to him; he's pretty convincing in person! I colored him in with a yellow marker and applied Diamond Stickles when it dried. 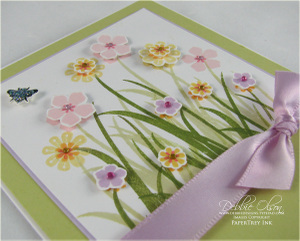 Bee and mat are cut with a Spellbinders Petite Plain and Scalloped circle die set. This is certainly a fun set for the honey lovers among us! Thanks, Candice--hope you are enjoying that honeymoon!